Here I'm just telling you how VITAS Neck Cure was done in Germany under my supervision. If you decide to follow this protocol, you do this on your own risk. In 1997 I had a bad rear end accident and the contusion of my neck caused severe neck pain and headaches. It was so bad, that I could not even lay down on the back of my skull - even the Tempurpedic cushion, that the doctor had prescribed to me, was of little help. Salvation came from Vita, my dear dear internet friend of over 10 years, an Ukrainian naturopathic doctor who is living and practising in Hillsboro, Orgeon. She sent me that exercise. I did follow her instructions religiously every morning and after 4 weeks I had no more pain !!! From here my big thank you and may God bless you. Ever since I have passed this exercise to many patients of mine, and they are all found relief. The exercise is safe, but if you are not sure, whether this exercise suits for your needs, please talk it over with your healthcare professional. Every exercise goes for exactly one minute. The best is, to use a loud ticking alarm clock, as at one point of of the exercise you cannot see the clock and have to count the ticks to 60. Sit on a chair and do not lean back. Both feet have ground contact and are not crossed. Arms and hands drop on both sides, you sit in an upright, relaxed positon. If there are uncomfortable sensations, just be aware without evaluating them. Concentrate on the opposite left side of the neck. Now, after 60 secs slowly lay the right hand on the upper skull on the left, and very softly apply some pressure. Don‘t counteract the pressure with your head! Hold for 60 secs, by, again concentrating on the left side of the neck. Now imagine how the energy flows through the middle of the upper head down the spine. Picture sun rays or just the flow of energy. Concentrate on the opposite right side of the neck. Now, after 60 secs, slowly lay the left hand on the upper skull on the left, and very softly apply some pressure. Don‘t counteract the pressure with your head! Hold for 60 secs, by, again concentrating on the right side of the neck. Now the head is moved passively into the upright position by putting the right hand to the upper skull, the left hand changes to the left upper skull and the left hand gently moves the head into an upright postion Now imagine how the energy flows through the middle of the upper head down to the spine. Picture sun rays or just the flow of energy. Concentrate on the frontside of the neck. Now, after 60 secs slowly lay the both hands gently on the forehead, and very softly apply some pressure. Don‘t counteract the pressure with your head! Hold for 60 secs, by, again concentrating on the front of the neck. Now the head is moved passively by sliding both hands slowly to the back of the skull and bring it into an upright position. Imagine how the energy flows through the middle of the upper head down to the spine. Picture sun rays or just the flow of energy. Concentrate on the back of the neck. Now, after 60 secs slowly lay the both hands gently on the back of the skull, and very softly apply some pressure. Don‘t counteract the pressure with your head! Hold for 60 secs, by, concentrating on the back of the neck. Now imagine how the energy flows through the middle of the upper head down to the spine. Picture sun rays or just the flow of energy. After that exercise the whole head and neck area should feel more relaxed and if you do it on a regular basis, there is a good chance that you get rid of the pain. 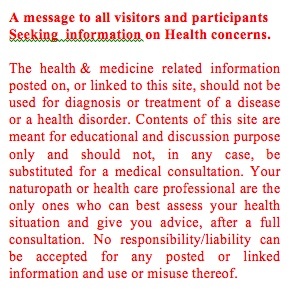 Disclaimer: This website was designed by Ulla Meyerhof, to provide information on European Naturopathic Healing Methods. Ulla Meyerhof is not a doctor, but a Germany licensed Heilpraktiker since 1976.